Brunch (a.k.a. Dinner) Exchange Berlin, Effizienzhaus Berlin, 12. Januar 2014. Dinner Exchange Berlin lädt am 12. Januar, 12 Uhr mittags, zu einem weiteren gesunden Sonntagsbrunch im Berliner Effizienzhaus ein. Deutschlands Effizienz von seiner besten Seite! Die Idee hinter diesem innovativen Regierungsprojekt ist, die vom Haus generierte Energie in Hochleistungsbatterien zu speichern und u.a. für das Aufladen elektrischer Fahrzeuge zu benutzen. Wir freuen uns, ein Menü aus frischem Bio-Obst und Gemüse, gespendet von Händlern des Markts am Rathaus Schöneberg und des Winterfeldtmarkts, an diesem progressiven Ort anzubieten. Bis dahin verbleiben wir mit sylvestrischen Grüßen! 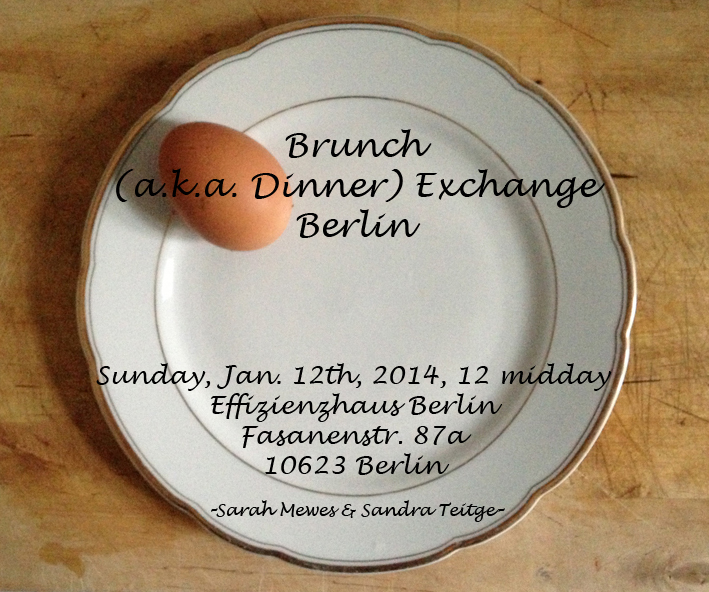 Dinner Exchange Berlin invites you to another healthy Sunday brunch at Berlin’s Energy House Plus (Effizienzhaus) on Jan 12th, 12 midday. German efficiency at its best! The idea behind this new government venture is that the energy generated by the house is stored in suitable high-capacity batteries and used to, for example, recharge electric vehicles. We look forward to serving a menu made from donated organic produce from the Rathaus Schoenberg and the Winterfeldt market at this progressive venue. Ukrainian pyrohy adventure in Northeast Minneapolis. Potato pyrohy with onions and sour cream. 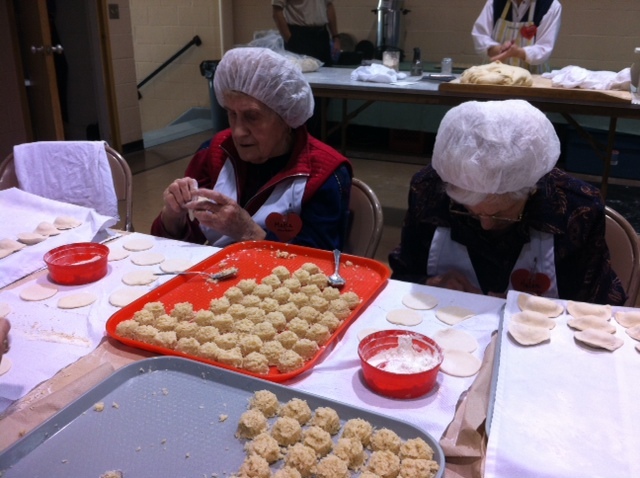 Dumplings are a part of many ethnic food traditions, the pierogi of Poland and the pyrohy in Ukrainian. 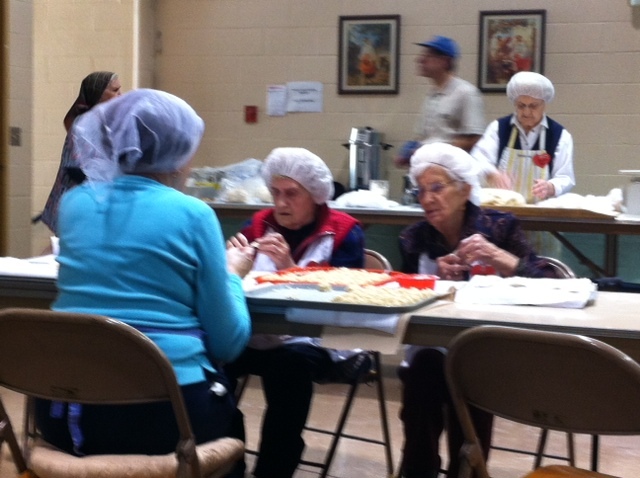 The folding keeps their fingers agile. 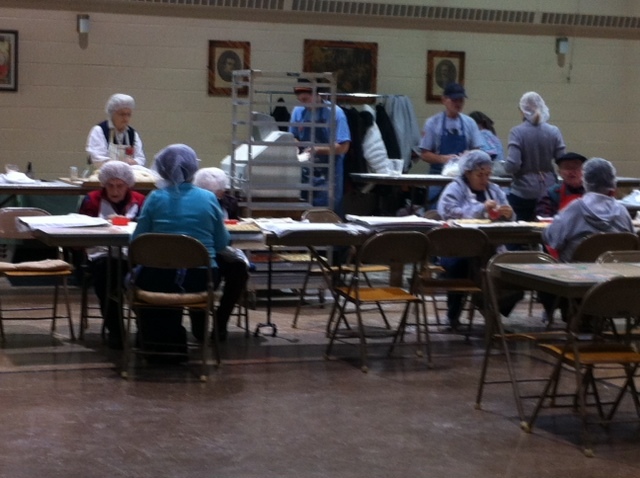 More than two dozen other volunteers were mixing, rolling, filling, pinching and boiling the dumplings recently in the school cafeteria and kitchen at St. Constantine Ukrainian Catholic Church in northeast Minneapolis. “Cost effective, easy to make, fills the tummy, all those good things,” says Nadia Doroschak. 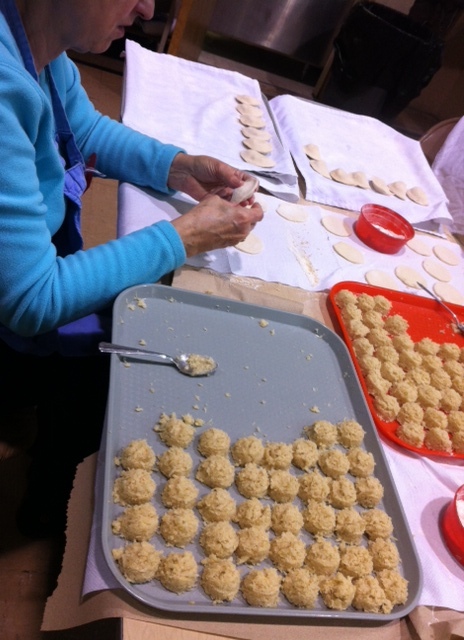 The dumplings look like ravioli, a two and half inch circle of dough that Maria Iwonoch folds over the filling. “Potatoes, cheese, onions, butter together,” she says. 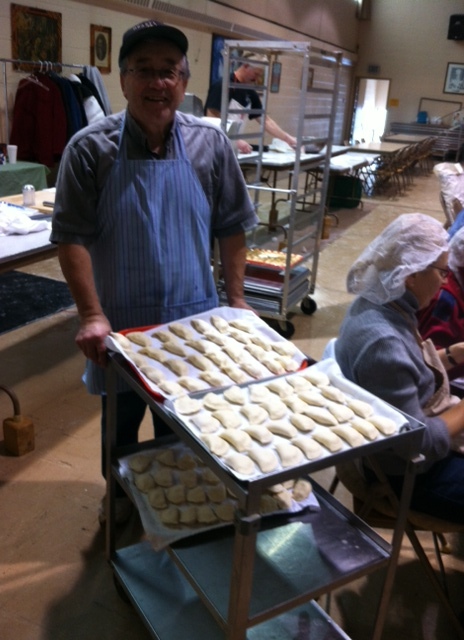 Pierogi or pyrohy production begins early every Friday morning at the church. It’s been that way for nearly 40 years now. Dough maker Larry Bell pours ingredients into the bowl of a huge commercial kitchen-sized electric mixer. These old ladies came from the Ukraine in the 1950s. One of the few men in this collective cooking action. 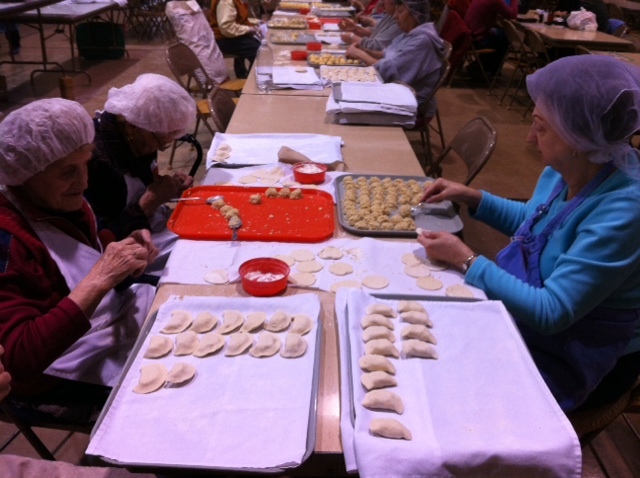 Every Friday during the fall, winter and spring months, volunteers gather to make delectable pyrohy (boiled dumplings). These traditional delicacies are filled with potato or sauerkraut. December 20, 2013 Special! One day only, pyrohy with prune filling will be available! Pyrohy are sold every Friday from 11 a.m. to 1 p.m. in the St Constantine’s school, except during summer months. You can eat in or take out.